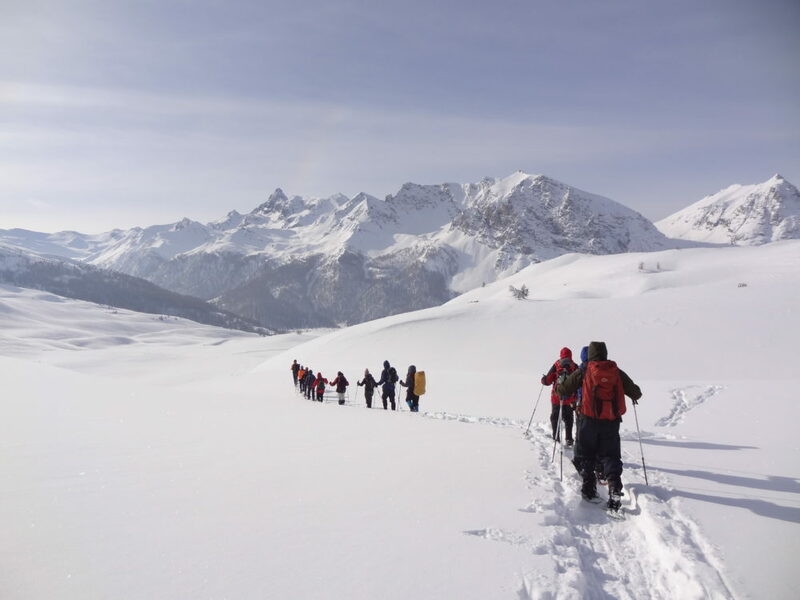 A fab, fab, fab week in the Southern Alps, on Exodus’ Transalpine Snowshoe Week (CAV), delivered by local operator France Outdoors. The weather was weird, with the Beast from the East bringing significantly more snow than is normal for late February, but we still got out and about and had an amazing time – largely thanks to Yves Novel, our fantastic guide and accompagnateur en montagne. My first time snowshoeing, but definitely not my last! For photos, see my Transalpine Snowshoe Week, February/March 2018 album on Flickr or click through to see day-by-day photos in my detailed notes below. Rendezvous at Ben Jonson House, with Steffi travelling over from Pembs and Dave coming down from Stourbridge. Hazel joined us for dinner of bangers and mash à la Phil, then it was off to Farringdon to catch the train to LGW. Overnight at the Premier Inn, Gatwick North Terminal, so as to be bright eyed and bushy tailed for tomorrow’s 6.40am flight to Turin. Steffi, Dave and I were more bleary eyed than bushy tailed when we convened in the Premier Inn’s reception at 4.45am, but thankfully we didn’t face anything more challenging than working out where to go for coffee after checking in. 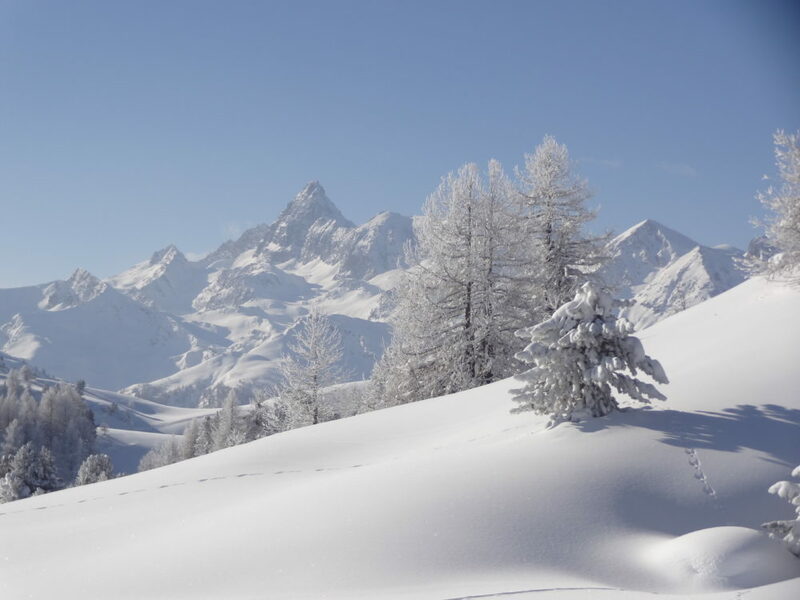 We were surrounded by lots of skiers – a very different crowd from Gatwick’s summer clientele. A good flight, with sunrise as we took off from Gatwick and amazing views over the Alps as we descended towards Turin. But cloud and rain awaited at ground level, as did Yves, who shepherded his 12 showshoers-to-be onto a waiting minibus, bound for Thures. 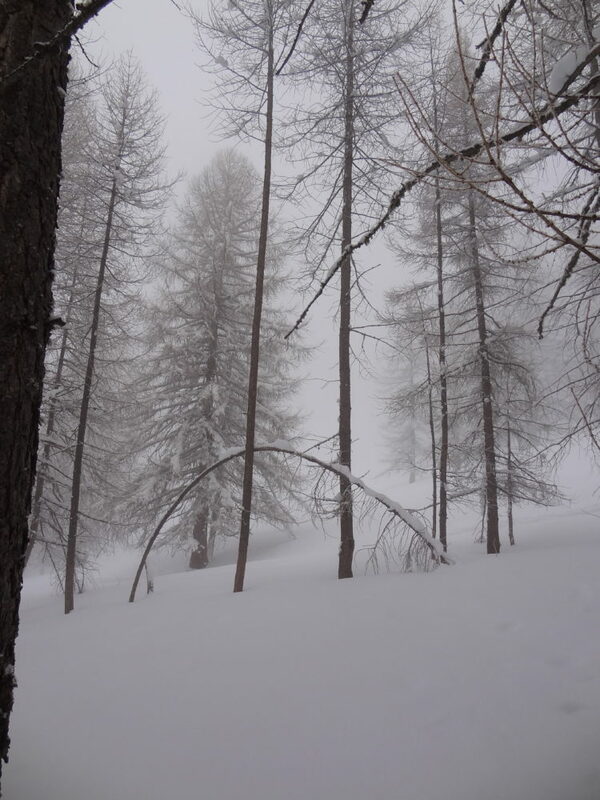 As the roads climbed up the Val di Susa, rain turned to sleet, which turned to snow. Grey skies overhead. Our first base was the pretty village of Thures about 90 mins drive west from Turin. We stayed at the Rifigio fontana del Thures, a lovely old wooden farmhouse now run as an auberge. We settled into the two dorm rooms upstairs, then gathered in the dining room for lunch. 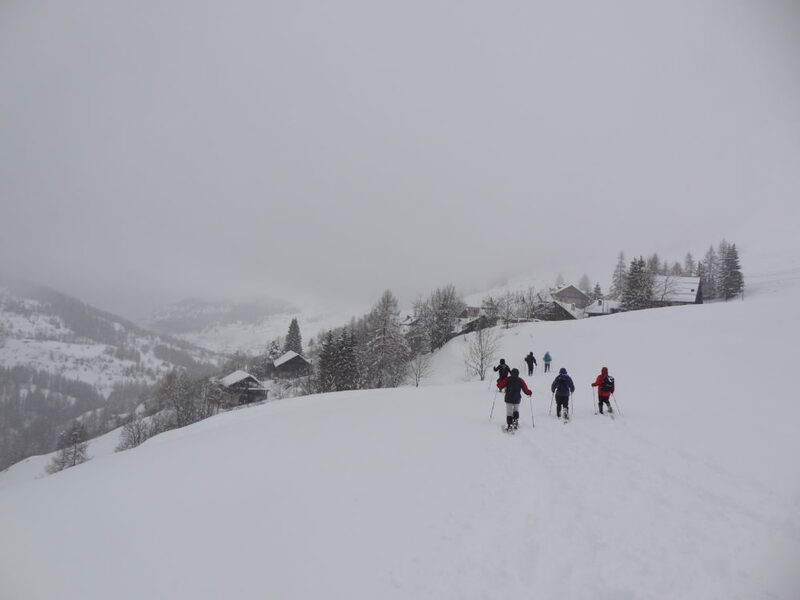 We spent our first afternoon getting to grips with snowshoes and poles on the meadows up valley from the village, and having avalanche rescue training with Yves. 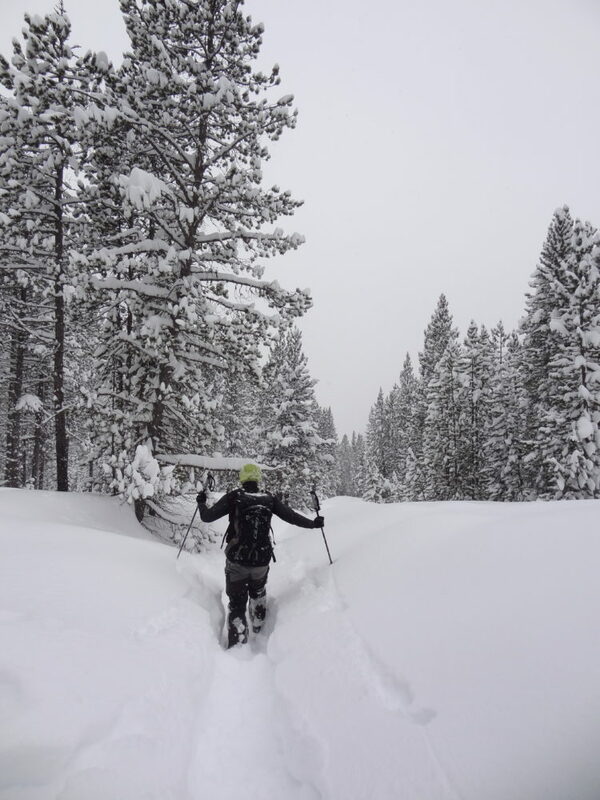 We carried avalanche transceivers, snow shovels and probes all the time we were out in the snow. Yves checked our transceivers each morning before we set out too. Beer and nibbles around the table next to the log fire before a hearty dinner. 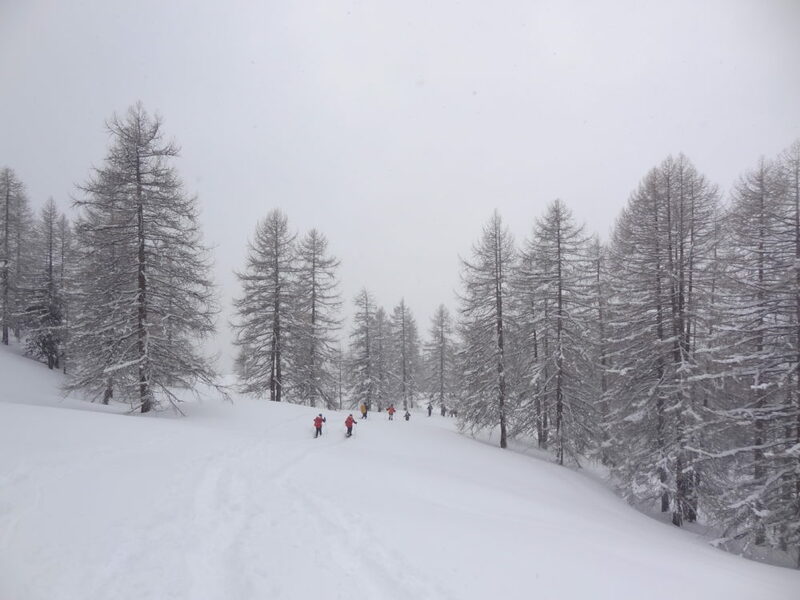 Our first full day dawned snowy which meant the ascent of Cima del Bosco was restricted to the lower forested slopes. The trees shielded us from the snow and we had plenty of practice at uphill, downhill and breaking trail through the snow in a beautiful monochrome winter woodland setting. Good food back at the Refugio, and another log fire. 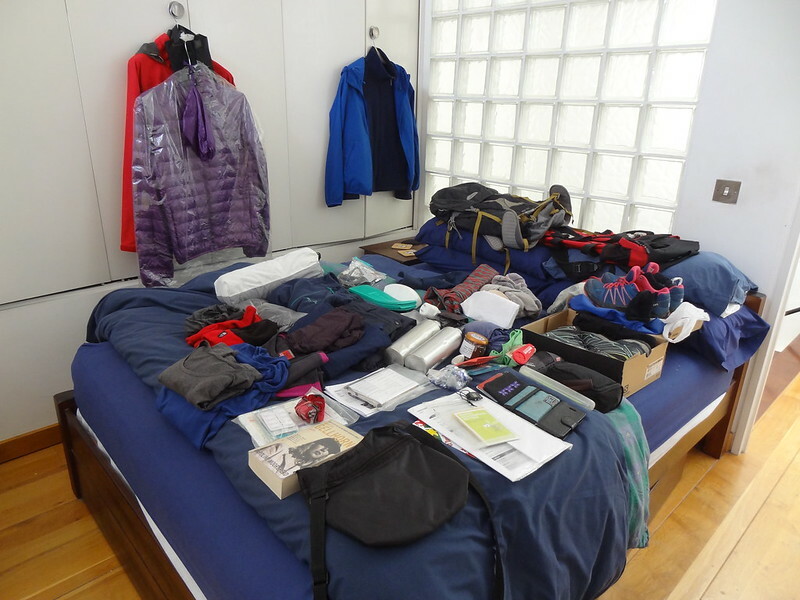 Next day brought the cold weather – -19°C first thing – and it was time to say farewell to our main bags, which trainee guide Ann transported onwards to Cervières, leaving us to carry essentials for the next couple of days/nights in our daypacks. You really don’t need much. Then we were off – straight down to the Torronte Thuras, crossing the river via a frozen weir and then ascending straight back up the other, steep, side and continuing along a forest road. At Pont de Rua, we turned onto a trail through the trees, way marked initially and then DIY zigzagging up to the ruins of Grange Dalma (? ), where we paused for a snack and photos. Then on into the Narnia forest and across the plateau via Peira Longa and Serra Brusa. The sun finally forced its way through the snowy skies adding extra sparkle to the snow laden pine forest as we neared Rifugio Capanna Mautino, the mountain hut which was our base for the next 2 nights. Wood panelled, with its window lined dining room soaking up the sun and stoves pumping out heat, it is not a million miles away from a Nepalese tea house. After polishing off the remains of our picnic lunch, it was decision time: some of the group opted for R&R in the hut (incentivised we learned later by the lure of Italian style hot choc, coffee & cake – and vin brûlé! 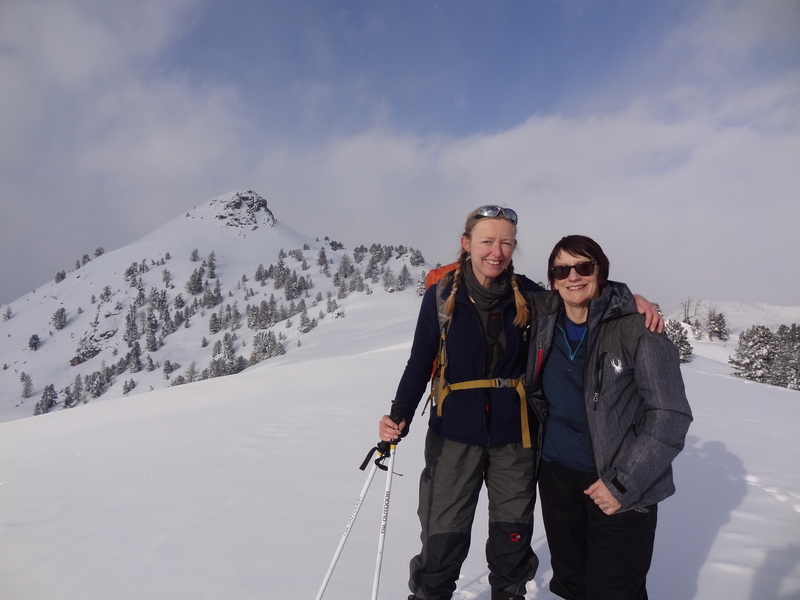 ), while the rest of us headed back out into the snow and spent a fantastic afternoon snowshoeing the Costa Via Veccia hills above the hut. Under miraculously blue skies, we each had a go at breaking trail (after which we marvelled at how Yves managed to do that so effortlessly, day after day), got super views and had our first go at tobogganing, AKA sliding down the tree-free steep bits. Waterproof trousers definitely delivered the best results…. Back at the hut we celebrated the day’s sun and fun with a carafe or two of red wine. Clambering up into and out of my top bunk that night was to prove challenging! The day dawned clear but cold: -25°C. I don’t think I’ve ever been anywhere that cold. It was dry though, so it didn’t feel cold, especially in the sun. 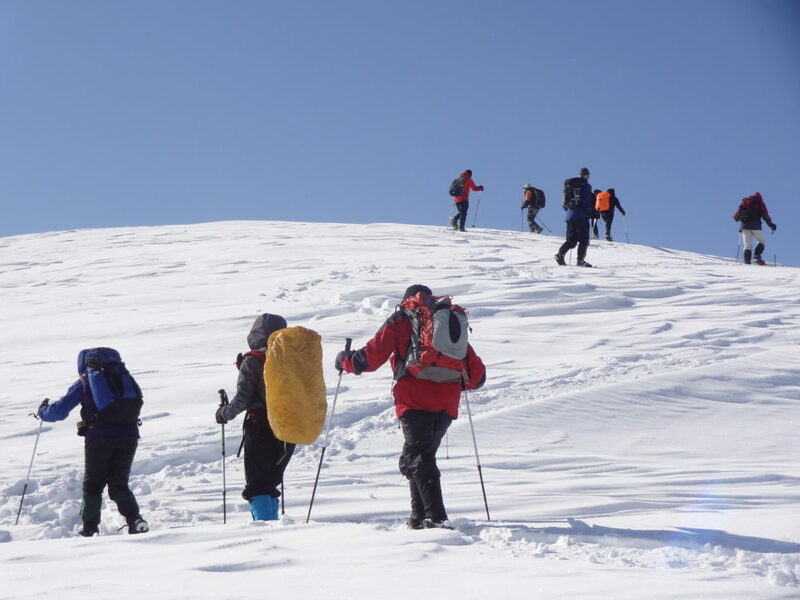 In exchange we had beautiful blue skies and pristine white snow as far as the eye could see …. (almost) all day …. Just magic. Tuesday was a real highlight for me – a long morning’s walk up to Cima Saurel (2451 m) and looping back to the hut for lunch, and then out again to go down from the hut and then up to reach the Col Begino (2331 m) just in time to catch the views before the skies turned grey. We started our morning by retracing our steps up and across the Costa Via Veccia. 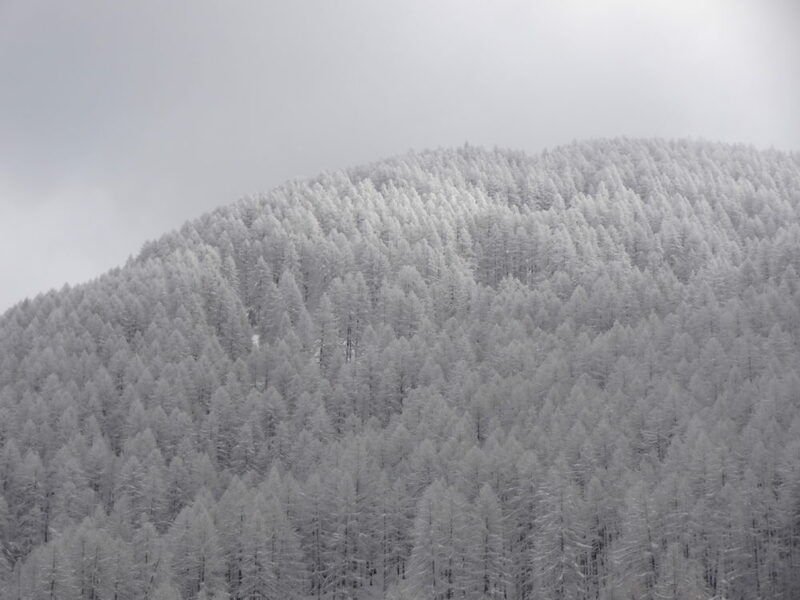 Pine trees sparkling white, some with delicate ‘catkins’ of snow, gave way to the tree-free terrain of the Costa La Luna. 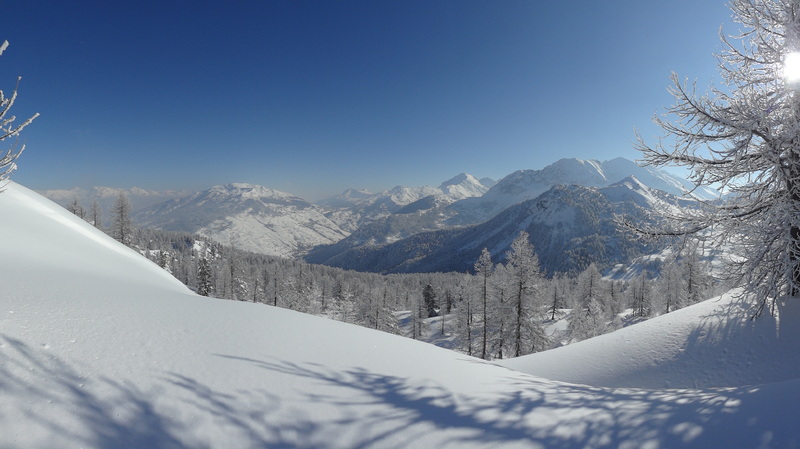 Steep slopes and hard snow meant we had to space ourselves out on the way up to Cima Saurel, giving plenty of time to soak up the sun and the fabulous, fabulous views , perched on the border between Italy and France – Cima Fournier (2425 m), Col Begino (2328 m) and Monte Corbioun / Mont Courbion (2430 m) across the valley, followed by Monte Giassiez (2588 m), Cima Dorlier (2758 m) and Dormillouse (2908 m) and occasional glimpses of Roc de Boucher (3285 m) beyond, with Pic de Rochebrune (3320 m) dominating the scenery ahead and clear views back down the Alta Val di Susa towards Bousson. 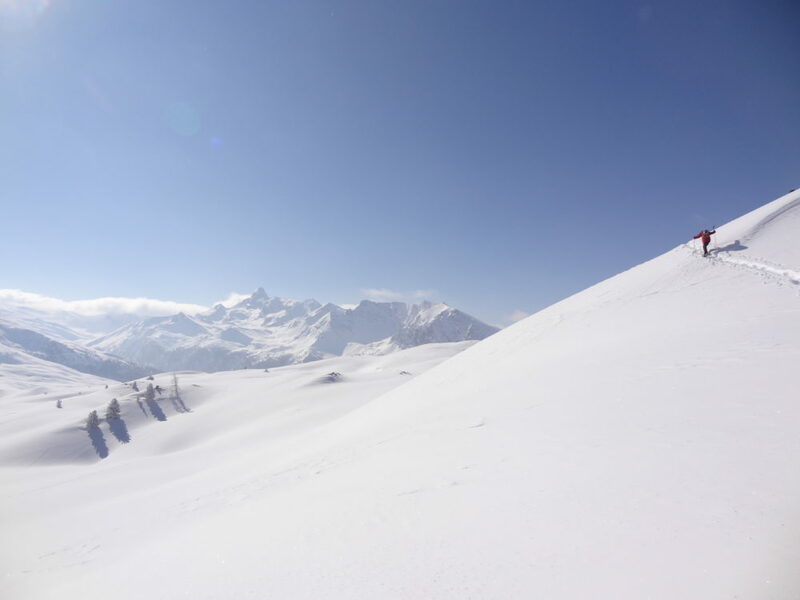 From the Cima Saurel we dropped down to the col, going most of the way on a mammoth DIY toboggan run – BRILLIANT! – and on down to Lago Saurel, hidden deep under snow and ice. Back at the hut we found an Italian army group on winter exercise, and a pasta lunch. Refuelled, some of us headed back out again for an afternoon snowshoe – dropping 100m down the slope below the hut to Grange Servierettes and the cappella di Madonna del Lago Nero, skirting the sleeping Lago Nero before climbing 300m back up over the Peira Roia to the Col Begino, where we caught our first glimpses of chamois high on the rocks of Monte Corbioun / Mont Courbion above. Back to the Rifugio Capanna Mautino for not quite such a boozy night. A memorable, magical day. Saying au revoir to the Mautino Hut we set off for Cervières, crossing the Col de Bousson and the border into France en route. 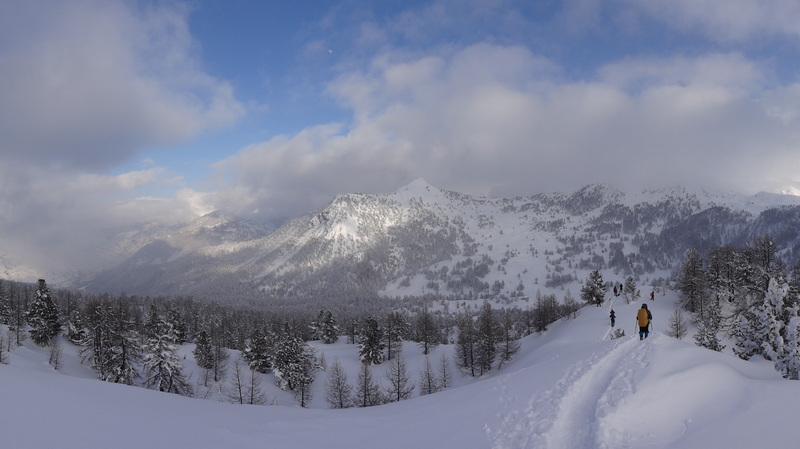 The day started off lovely with great views of Cima Saurel and Pic de Rochebrune, but then the snow clouds clustered and the wind picked up and it was FREEZING. The couple of hours we spent walking along the Val Cerveyrette from the summer village of Le Bourget to Cervières the hardest part of the trip by a long way, largely due to the wind. 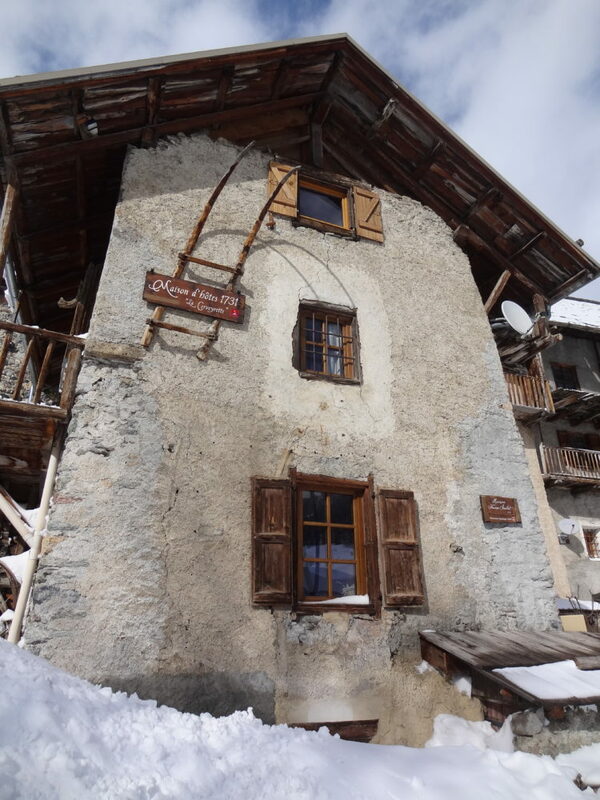 We were all very glad to reach the Maison d’hôtes La Cerveyrette, in the middle of the old village of Cervières. Another converted farmhouse, it was our base for the rest of the trip. A warm welcome from our hosts, Stef and Julien, was matched by that of the old cellar where radiators were on full blast – as were the filter coffee machine and kettle. The warmth, and the rest of our picnic lunch, perked everyone up and we had the rest of the afternoon free to explore. 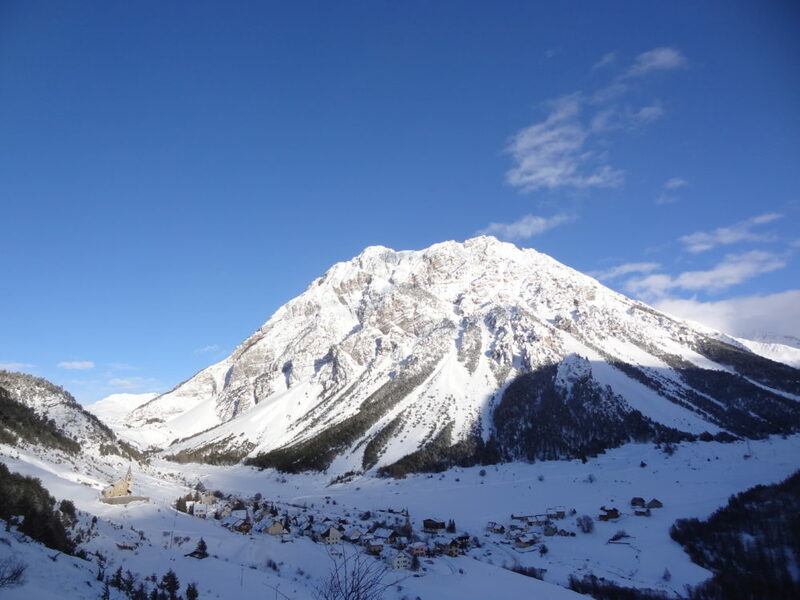 Most of us found our way to Cervières’ sole hostelry, the Hôtel d’Izoard, for a vin chaud or two before dinner. It snowed pretty much 24/7 for all of our time in France. The view from our windows on Thursday morning was of snow whirling around the village. We couldn’t even see the sky, but I’d bet it was dark grey and full of more snow. 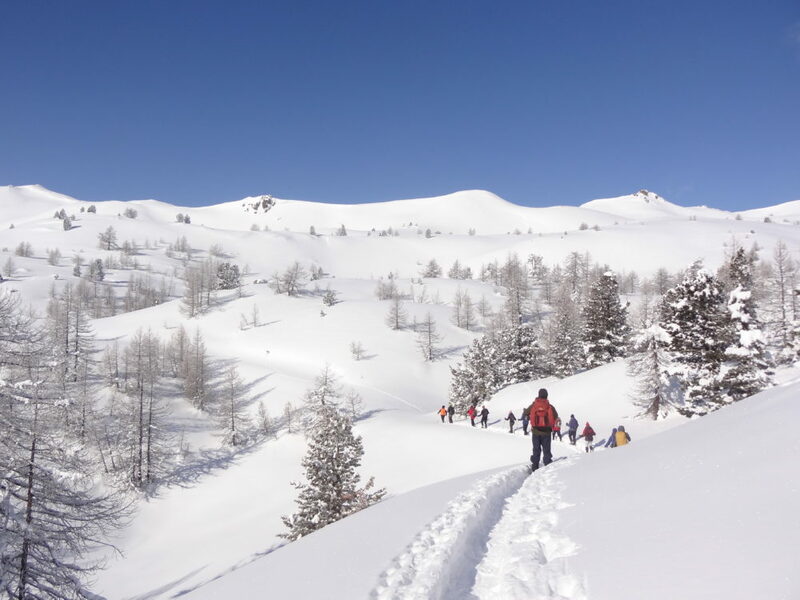 Setting off into the snow, and the wind, we put our trust in Yves’ assurances that we’d be spending the day in one of the sheltered valleys leading off south of Cervières. And so it was. Almost as soon as we left the village we were out of the wind that hurled the length of the Val Cerveyrette and it was an easy walk to the village of Le Laus where the valleys of the Rochebrune / Blétonnet / Les Oules, and the Izoard / Bois des Loubatières meet. Turning south east into the forest we headed first for Le Blétonnet, where the roof of the tiny chapel was piled high with snow, and then deeper into the Bois du Laus for lots of off piste fun – wading through snow and crossing streams, not all of which came with any sort of bridge…..
Back via Le Blétonnet to Le Laus, where we called in at the Auberge l’Arpelin for coffee / hot chocolate / vin chaud before snowshoeing back to base. It did snow all day mind you. Still, we celebrated St David’s Day in style – presenting Dave with his daffodil costume before dinner. Sorry, no photos…. On Friday morning Yves-le-Taxi provided a shuttle service to drive us to Le Laus, and from there we headed off into the Bois des Loubatières and up the Izoard Pass Road (D902) to about 2000m before persistent snow forced us to turn back without reaching the Col d’Izoard. Revived by hot drinks and snacks back at the Auberge l’Arpelin, and with the skies surprisingly starting to clear for the first time in days, most of us opted to walk the 1.5km from Le Laus back to Cervières. The week ended on a high note as the afternoon’s clear skies meant we could climb up into the hills above Cervières, where the summer meadows and high plateaux of Le Sautaire and l’Alp du Pied afforded super late afternoon views of Lasseron and the peaks beyond Le Laus …. … plus a couple of last goes at tobogganing downhill. You can never have too much of either. Yves had headed off to meet his next group last night, so we had the morning to entertain ourselves until our minibus reappeared a little before 2pm. 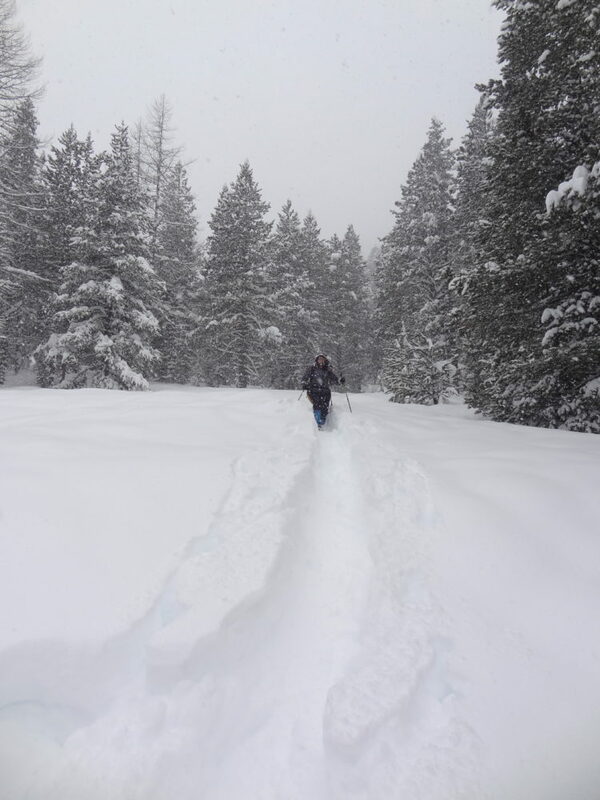 Snowfall had resumed, so the plan to snowshoe to Le Laus for an early lunch back at l’Arpelin was put on hold. Some folks headed over to the Hôtel d’Izoard instead; snug in the cellar, I caught up with my diary. Thankfully not much sign of snow once we were out of the mountains and driving towards Turin, and our flight back to Gatwick was only delayed by an hour, mainly due to the need to de-ice the plane each time it landed. Train to Clapham Junction, and a walk along the mucky gritted pavements to Hazel’s for cheese, wine, chat and bed. 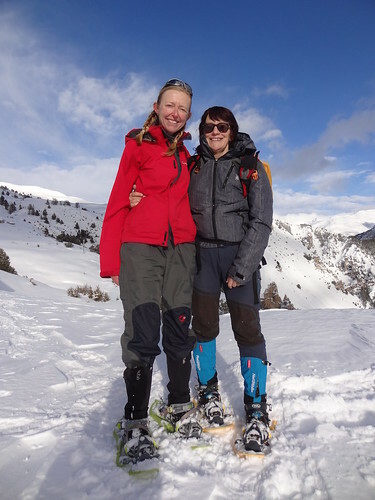 On Sunday, having seen Dave and Steffi safely start their journeys home, I caught the 344 bus back towards the Barbican and spent the afternoon downloading photos and making a start on my Snowshoeing in Italy / France: We’re Back! blogpost. 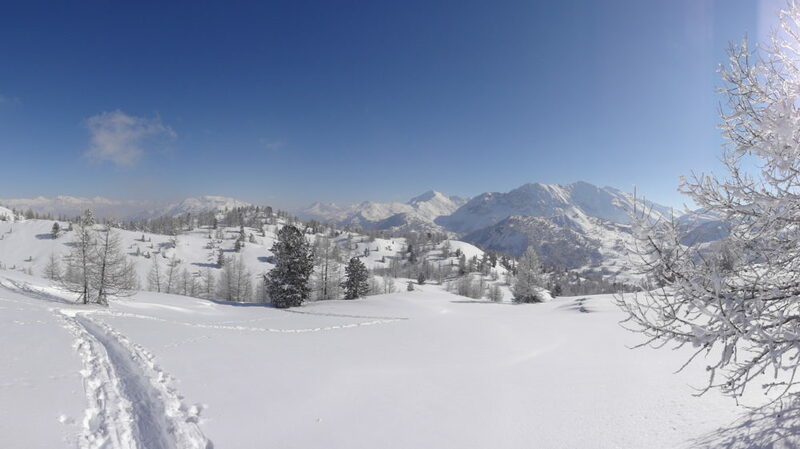 Overall, a wonderful trip and I am already planning a return to the Southern Alps for more snowshoeing this time next year, possibly booking direct with France Outdoors. 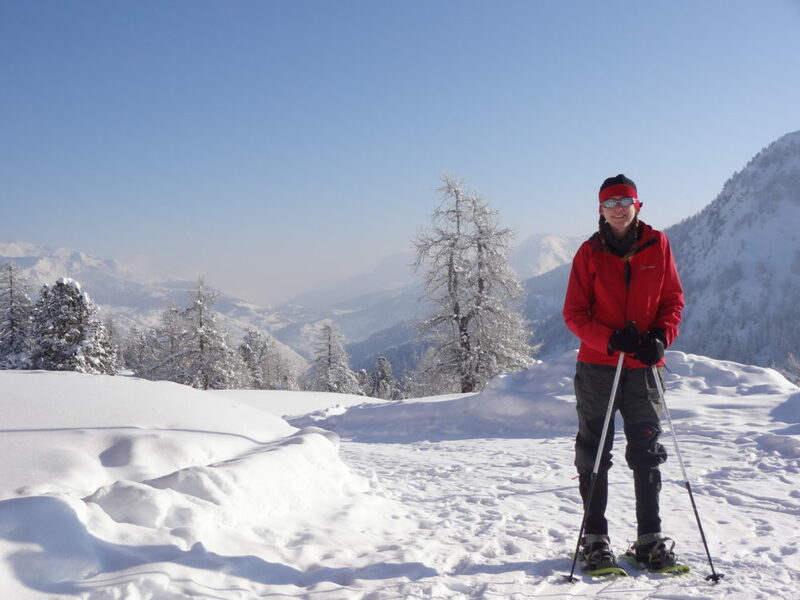 Snowshoeing in Italy / France: We’re back! 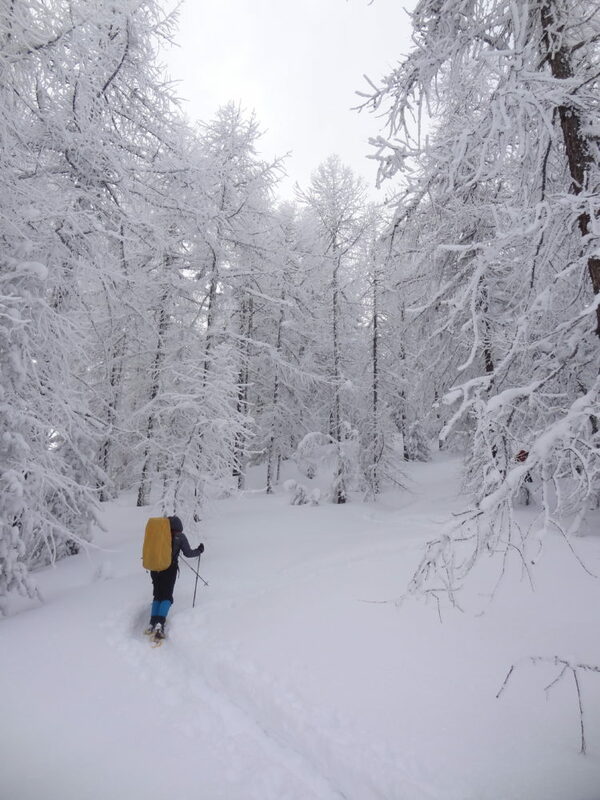 Back to London after a fab week snowshoeing in the Southern Alps where we had a *lot* of snow and Arctic conditions ….. and although this meant we didn’t get all the advertised views and snow conditions curtailed our routes somewhat, you don’t miss what you don’t know. 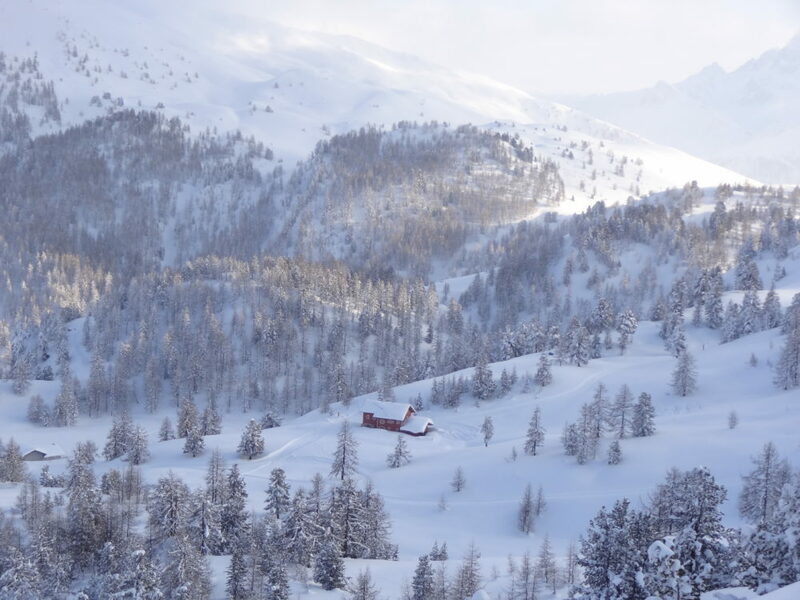 We still got out and about and had an amazing time – ploughing our way through larch forests knee deep in snow, being dazzled by the pristine white landscape of the peaks and plateaus and the sparkling alpine scenery, tobogganing down hillsides and crossing sunken streams. 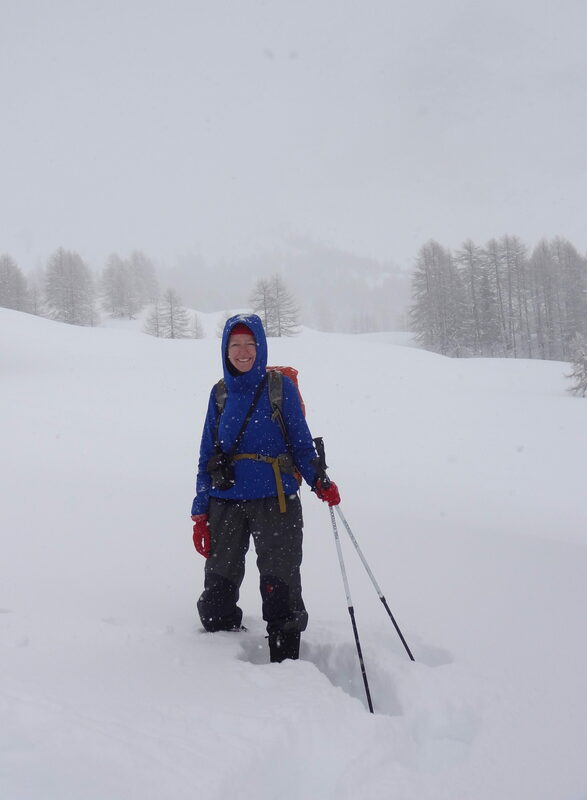 The day we spent on a figure of eight around the Rifugio Capanna Mautino was just magical – Costa Via Vecchia, Costa la Luna and Cima Saurel in the morning, and up to the Col Begino in the afternoon. We got lots of avalanche / snow assessment training too from Yves, our fantastic guide and accompagnateur en montagne. Amazingly knowledgeable and great company too – he really made the trip. Thankfully not much sign of snow once we were out of the mountains and driving back towards Turin at the end of the week, and back in my bit of Blighty the snow has all gone – missing out on The Beast from the East feels a bit like being out of the country when Princess Di died. 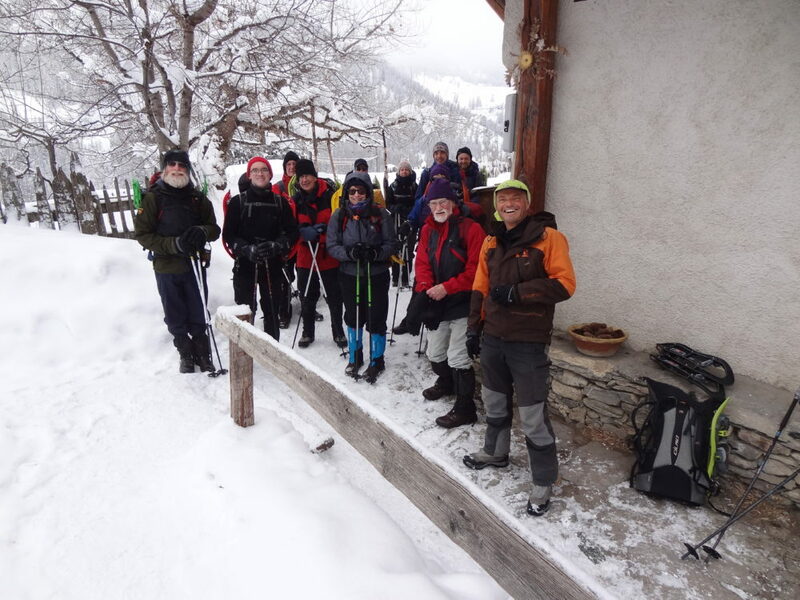 So, all in all, a really great trip – I am planning to find another snowshoe holiday for next Feb. Hopefully that won’t mean we all get Arctic weather again…. And despite the cold (-25°C one morning at the Mautino Hut, -24°C the next) I didn’t need to use Hazel’s down jacket. It turns out dry cold is very different from the damp version we’re more familiar with! I have to say that I was very pleased to have my Mountain Equipment mittens (wool fleece lined and waterproof – VIP given how many times I fell over in the snow and needed to do a downward dog to get upright again) and my Rab gaiters (Latok Alpine) with me though. I wore both bits of kit daily. My standard outfit was Uniqlo Heattech base layer, Uniqlo fleece zip up jacket, Goretex jacket (wind and waterproof), Gelert walking trousers, Kathmandu “Mammut” waterpoof trousers, plus gaiters, with a fleece hat, mittens and buff completing as needed. Here are some photos to whet the appetite: more to follow once I do the Photos & Notes [<– now done!]. On the downhill run for our Transalpine Snowshoe Week, with Exodus. … purchased – LV= again. Premier annual multi-trips policy, Worldwide excluding North and Central America, Caribbean and Bahamas. 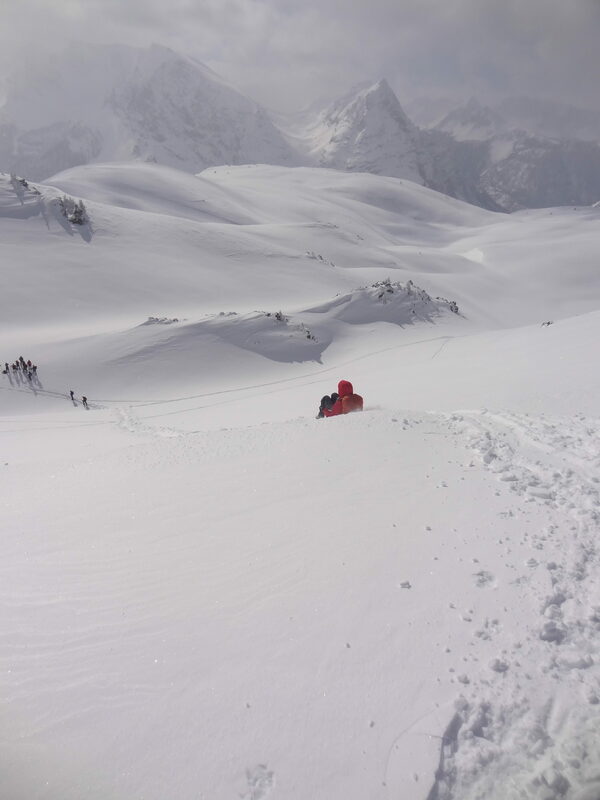 Premier level covers trekking up to 6000m (in anticipation of Tsum and Manaslu in November). Update: Winter Sports cover added. LV= doesn’t list snowshoeing as one of the activities that requires Winter Sports cover, but it turns out that it is. Thanks to Steffi for the tip! … checked – I had a whole lot redone in advance of my 2016 Nepal trek (in line with TravelHealthPro’s recommendations for Nepal) so I am all up to date with Hep A, Typhoid, Hep B, Diphtheria–Tetanus-Polio and Rabies. Next top up jab will be Typhoid in August 2019. Not that I’ll need any of these for Italy/France. … from Thomas Exchange Global / BestForeignExchange.com on Wormwood St.
…. monitored / monitoring – looking chilly thanks to the Polar Vortex. I’m borrowing Hazel’s superior down jacket and taking my Icebreaker thermals and wool fleece lined mittens. We got clarification on when / where we’ll have access to our luggage, and confirmation that we aren’t expected to carry our main bags to the Mautino hut. Day 1 + Day 2: the group will stay in the same gite in Fontana del Thures, so you will have access to your main luggage. Day 3 (Monday): a taxi will take everyone’s luggage in the morning to Cervières. So you won’t have access to your main luggage for 2 nights – you’ll just have what you take in in your backpack. Day 5 + 6 + 7: the group will be reunited with their main luggage in Cervières. So you can leave your main luggage with what you don’t want/don’t need to carry for the Mautino hut on Monday morning to be transported to Cervières. Our local partner confirmed that on arrival there usually is a stop to buy some food on the way to the gite. On departure day, the transfer is planned around 2pm, so the group can eat at the gite or at another Auberge in the village. Additionally you could also buy a picnic at the gite to take away – there are no supermarkets there. Steffi’s bringing Cardigan bread and cheese, and I’ve got a small pot of chutney to contribute to a picnic lunch on Saturday. I have to say, our main contact at Exodus has been great at finding out these additional details for us, and very good at replying to our random questions. …. and we’re checked in for the flight to Turin too. Boarding passes printed. It’s 2018 so I can start final preparations for the first trip of the year … Exodus’ Transalpine Snowshoe Week. The kit list is ready. I have a spreadsheet with tabs for kit list, itinerary & flights, insurance & emergency contacts and money. The kit list lists everything I usually take on a trek/trip, right down to extra plastic bags (always take more than you think you’ll need), which I use as the starting point for each trip. Based on the Essential Equipment given in the Exodus trip notes, I’ve added “sit mat” and removed “thermals” and a few other camping/trekking-related items. I’ve found the YR forecast for Thures, which is where we actually are at the start of the trip. The last piece of prep, other than packing, will be to get my annual travel insurance. Probably go with LV* again as they’re still rated as the best value policy on MoneySavingExpert, and their Premier level insurance covers “Trekking and hiking and fell walking up to 6000 metres“. Steffi, Dave and I have been coordinating our Friday rendezvous, and the plan is food followed by the Thameslink down to Gatwick for our night in the Premier Inn.